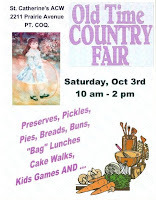 Members of the St. Catherine's Anglican Church Women (ACW) will dress in period costume when they celebrate their 100th anniversary with an old-fashioned country fair on October 3. The event will take place at 2211 Prairie Avenue (Trinity United Church building) from 10:00 AM to 2:00 PM. The fair will feature items that the ACW’s founding members would have used to raise money for the church in the early 1900’s. There will be kids’ games with prizes galore, cotton candy, “bag” lunches, cake walks, and food sales (baked goods, canned fruits, pickles, jellies, jams and fudge). The ACW was organized as the Women’s Auxiliary in February 1909, when local citizens were preparing to construct the first Anglican Church in Westminster Junction (later to become Port Coquitlam). Within three years, through concerts and sales of needlework, the women had raised enough money to pay back a $500 loan for the church’s construction and purchase an organ. Over the years the ACW have contributed linens, vestments, prayer books and furnishings for the church and parish hall. In the 1970’s their fund-raising helped to repay the debt for constructing a new church building on McAllister Avenue. They also do catering for weddings, anniversaries and funerals and provide supplies for churches in remote areas of northern BC and Yukon.